Please read the item description under the photos first. Next, enter the city or town name you want to feature on the map. *Neighborhoods and streets don't show on the map. Also please add the TEXT you'd like printed below the map. Thank you! 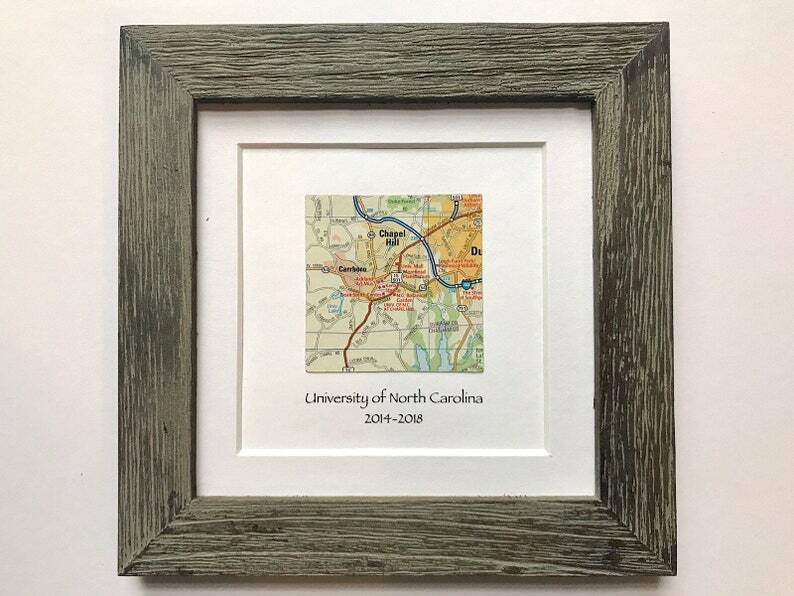 My popular customized map gift is now available in a gray barn wood style frame. I'd love to make this unique framed map art just for you. 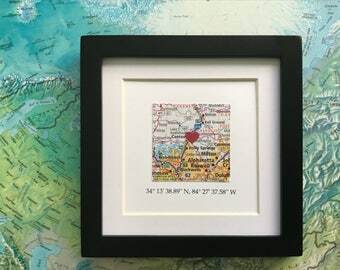 Choose a city or town, a map shape + the text and you've designed a one of a kind gift for yourself or someone else! ☞To order: During checkout, choose your map shape and gift wrap option from the drop down menus. In the box for personalization, type the name of a CITY or TOWN for the map. Also type the text you would like - up to 3 lines. This makes a wonderful gift for many occasions- housewarmings, graduations, engagements, weddings, Christmas, Valentine's Day and more! Gift wrapping is available for this item. I use quality kraft paper and colored twine and can include a gift note if you request it. Etsy keeps your payment information secure. Individual shops never receive your credit card information. If there is a problem, I would love to work with you to solve it, so please contact me right away. If a refund is needed, however, I'll be happy to return your payment if you request it within 14 days. No refunds will be given after this time. *There are no refunds on orders that have been customized unless there was a mistake on my part. All items are shipped through the US Postal Service within the time frame posted for that listing. I pack all orders securely. In case of damage during shipping, please let me know right away and send a photo of the item and the packaging for insurance purposes. I will send a replacement item after receiving the photo. Please be aware that international shipping could take 2-4 weeks or longer. Buyers are responsible for any customs and import taxes that may apply. VAT is NOT included in the purchase price and may be added to the shipping cost when the package is delivered. I have no control over this or delays due to customs. Q-What if I like your shop, but don't see exactly what I'm looking for? A-Try clicking on "Ask a Question" or "Request a Custom Order" and ask away! I may be able to help. Q-What size, shape, color is this item? A-You'll find the Item Details under the photos on both the Etsy website and the Etsy phone app. It's important to read the description before buying. If you still don't see the answer to your question, feel free to ask. Q-May I customize items in your shop? A-Most items are made when ordered and many actually feature customization such as names, dates and map choices. Please type your requests in the "Notes to Seller" box during checkout. Additions and changes beyond those previously mentioned may incur an extra charge, so if you aren't sure, please ask. Q-Can you be found elsewhere on the web?